Every land has its own spirit, and our Romanian one is filled with spirituality and tradition. One of the traditional lodes is represented and disclosed by the ceramics that originate from the most ancient times. Three essential elements: soil, water and fire – the soul of each potter – take shape and enjoy a great admiration even in our days. 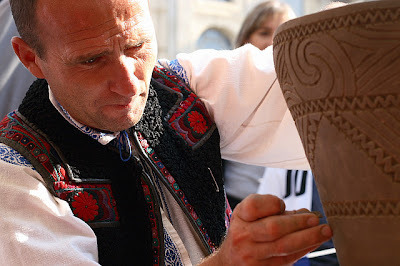 Pottery, situated between craftsmanship and art, is inherited by Romanian people from our Neolithic ancestors ever since the earliest times. Being at the border between craftsmanship and art, more precisely between utility and materialization of some artistic traits, all vessels, no matter of their kind, embrace artistic virtues that originate from a real science, from the imagination of the craftsman, from the difficult and not at all easy mastery of the techniques. The effort of the potter begins when selecting the soil, a place known only by him; the soil is brought to the fireplace where it begins to be cleaned, leavened, kneaded, shaped, dried, encrusted and burned. Thus, the best quality clay is brought home and left for leavening for several weeks. During this process, the clay is minced and watered at a certain time interval. Then the clay is cut in large pieces, beaten with the mallet and watered. These clay pieces, also known as pies, are brought in the workshop and placed on a wooden platform. Afterwards it is being repeatedly kneaded with the feet, then with the hands, until it gets a greasy aspect. The clay is then cut into slices with a knife, pieces that are also kneaded and beaten with the mallet so as to obtain a homogenous paste. When the potter considers that the paste is good, he divides it into round and equal shape cobs. The leavening and the kneading are considered to be among the most important operations, being careful and laborious but in the same time ensuring the quality of the products. The clay cobs get then on the shaping table. 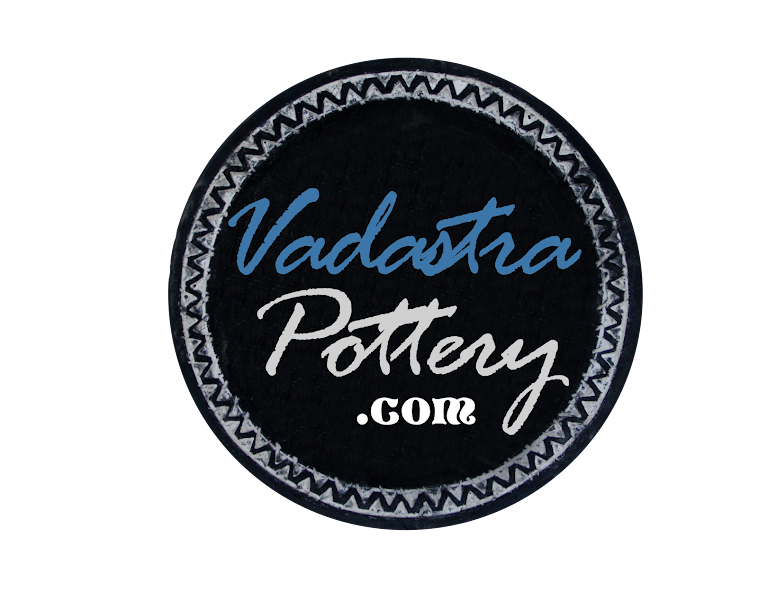 For the Vadastra ceramics, the pottery knows a certain and special technique, which does not imply using the potter’s wheel, but a string and the artist’s hands. „I lift the pot with the string. First of all I create the bottom of the pot, which is similar to a pie, then I make a string that I place as if a spiral and, with the help of this, I lift the walls of the pot, always pressing and making it uniform. After lifting the pot, I smooth the pot and decorate it with various motives: simple spiral, double spiral, wolf fangs – simple and double, zigzag wolf fangs. These represent the continuity of life on Earth! I then leave it to dry for several days and afterwards I cook it in the oven at 900 degrees Celsius in order to obtain its specific black colour. When removing from the oven, I secure the kaolin on the walls of the pot which has the role of emphasizing the decoration.” the craftsman says. Different hand-made pottery using ancient methods and techniques similar to those from the Neolithic period discovered in Vadastra area. The pottery with handles, amphora and figurines made by Cococi Ionel from Vadastra, are decorated with lines that are identical to those from the Neolithic period. His works have awakened a great interest among experts from all over the world, who welcome the revitalization of the old Poterry center in Vadastra. The workshop is held at his farm house in Vadastra, a very old area with incredible traditions and customs, near the right bank of Danube, in Olt county, Romania. “The pottery artisan Ionel Cococi is today our only guide through time to our «ancient roots».” Ph. D. Zefir Ghencea.